Not to be confused with Tubal. Tabal (c.f. biblical Tubal) was a Luwian speaking Neo-Hittite kingdom of South Central Anatolia. According to archaeologist Kurt Bittel, the kingdom of Tabal first appeared after the collapse of the Hittite Empire. 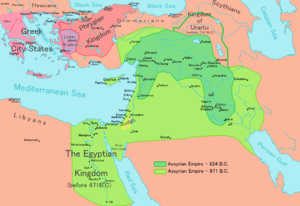 The Assyrian king Shalmaneser III records that he received gifts from their 24 kings in 837 BC and the following year. A century later, their king Burutash is mentioned in an inscription of king Tiglath-Pileser III. The kings of Tabal have left a number of inscriptions from the 9th-8th centuries BC in hieroglyphic-Luwian in the Turkish villages of Çalapverdi and Alişar. Tabal and its people are often identified with the tribe of the Tibareni (Tibarenoi in Greek, Thobeles in Josephus) who lived near the Black Sea. They are mentioned in the works of Hecataeus of Miletus, Herodotus, Xenophon and Strabo. On this ground, the Georgian historian Ivane Javakhishvili (1950) considered Tabal, Tubal, Jabal and Jubal to be an early Kartvelian tribal designation. Whether there is really any connection between the Tibareni of the Black Sea coast and the Tabal kingdom of Southern Anatolia is uncertain, ancient authors may have already confused the two. ↑ Trevor Bryce: The World of the Neo-Hittite Kingdoms: A Political and Military History. Oxford, New York 2012, p. 141-145, p. 306f. 1 2 3 Trevor Bryce: The World of the Neo-Hittite Kingdoms: A Political and Military History. Oxford, New York 2012, p. 141-145, p. 306. 1 2 Trevor Bryce: The World of the Neo-Hittite Kingdoms; A Political and Military History. Oxford, New York 2012, p. 141-145, p. 307. 1 2 Tübinger Bibelatlas / Tübingen Bible Atlas. Siegfried Mittmann, Götz Schmitt (eds. ), Stuttgart: Deutsche Bibelgesellschaft, 2001, Map B IV 13. ↑ Trevor Bryce: The World of the Neo-Hittite Kingdoms; A Political and Military History. Oxford, New York 2012, p. 293. 1 2 3 Christian Marek, Peter Frei: Geschichte Kleinasiens in der Antike. Munich 2010, p. 802.